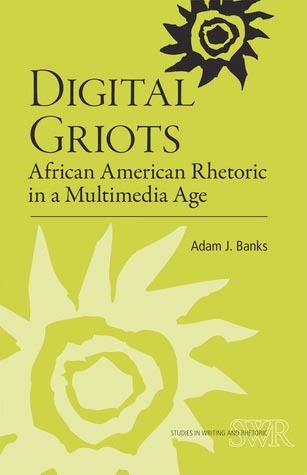 Adam Banks’s Digital Griots: African American Rhetoric in a Multimedia Age asks us to embrace the possibilities of the grooves that exist between African American rhetoric and multimedia writing. By positioning the DJ as a storyteller, I believe that Banks strategically opens up needed dialogue about a different way to approach and understand what transformative access to technology can be while simultaneously working to encourage African Americans to carry on the rich traditions of the griot in digital spaces. Although refreshingly innovative, Banks’s idea about the promises of African American rhetoric, especially in regards to Black Theology and ethics, could be viewed as utopic. It may be difficult for folk who are not as familiar with Black Theology to buy in to the ways in which liberation and transformation can be used as strategies toward racial justice. Also, the chapter does not take into account other theological practices that could achieve similar results for American Americans and technology use. Despite these critiques, I know that this text would prove useful for instructors, graduate students, community organizers, and people who are interested in conversations about access to technology and African American rhetorical traditions. Fundamentally, Banks’s work adds to conversations in Composition Studies as scholars like Cynthia Selfe and Madeleine Sorapure speak about the need to reexamine what it means to be multimodal, especially since “in our educational system, and in the culture that this system reflects, computers continue to be distributed differently along the related axes of race and socioeconomic status” (Selfe 101). Banks is able to take the conversation a bit further by using the DJ as a storyteller that helps us understand the notion of a digital humanities project, an idea that is relevant and needed in order to continue conversations on how we can ignite progressive and meaningful access to technology for African Americans.